ACOUSTIC EXPO 2013: Every so often, a songwriter comes along with such prowess and soul that it seems anything they turn their hand to results in sheer perfection. For many people, acoustic player Foy Vance is one such songwriter. One of his first big successes was the single Gabriel and The Vagabond, released in 2006, before his debut album, Hope, arrived the following year. In demand, Vance's work has been included in Oscar winning films (The Shore), teeny films (Warm Bodies) American TV dramas (Grey's Anatomy, House, The Vampire Diaries), and charity adverts (Great Ormond Street Hospital). As for his live shows, the Northern Ireland based artist has played everything from prison gigs (more later) to headliner sets. "I don't really know. I'm not, like, an aficionado. I mean, I know the writers that I like but I never wanted to dissect songs in any way and figure out how they fit together. I like the mystery of songwriting; of not knowing what I'm writing about until it becomes clear later on. There are people who have an approach - they wanna write in a certain style - and there are people like Sting who see it mathematically and in sections. I just like to play, so I write by sitting down at the piano and improvising until something feels nice." What songs from Joy Of Nothing exemplify that best? "There's a song called Paper Prints which is certainly one of my favourites on the record. Just because it's one of the songs that keeps on changing for me. Some songs are definitively about something and that is written about something. There's a story behind it but it's a little too peculiar to tell." "I like the mystery of songwriting; of not knowing what I'm writing until it becomes clear later on"
There was a six-year gap and a series of EPs between your debut album and this one. Was it difficult writing about 'nothing'? "No, I've never found it difficult to write songs. I think writing songs is easy. The difficulty is writing a good song. That's where it gets difficult. I'm always writing - there's always material coming up for me because I enjoy it so much. I suppose since Hope, I never had a full album's worth of tracks that I felt fitted together. For a while I was looking at making another album with loads of different styles on it but I did that with Hope. I was waiting for songs that sounded like one big happy family. Now they're here." People call you the 'real deal' because of the emotion conveyed on your songs, especially tracks like Janey. How do you capture it? "I guess if you can't get into the moment, don't do it. It's important to deliver the songs. When the songs come they have not only got the cognitive parts of chords, melody and rhythm, but there's also the sort of transcendent element. You know, the emotion behind it all. Write songs that you enjoy singing, that's the way I do it." People talk about how passionate you are while performing. Where does that come from? What's driving you? "Well, I enjoy what I do - I make music. It's a beautiful thing to get lost in. It's kind of a redeeming factor in my life. I mean, if it wasn't for music who knows what I'd be doing. I'm grateful that I'm able to do music and lucky to be so engaged in it." You've had some varied gigs in your time, including playing at prisons. How did that come about? "That was a really good experience. It came about through a guy I met at a gig one night and we got talking about it. I think in the beginning, you know, Johnny Cash did it and I just wanted to be Johnny Cash. I wanted to experience it to see what it was like, but when I went there I realised it's quite an interesting gig to do. Music in all places is interesting - how it affects people - so going into a prison and singing songs to a room full of people who were drug barons, murderers, you know, all kinds of people, you realise very quickly that they're more than the sum of their sentence." "Yeah, I did an Oscar-winning film called The Shore with a guy called David Holmes. The thing with David Holmes is that he's a sensational film composer - he really knows what he's doing and pretty much leads the charge. We used a lot of my songs, but I realised it wasn't something that came naturally to me. It's one thing I could develop, but I wouldn't be interested right now. I'm just going to focus on writing songs and singing them out loud." "Music is a beautiful thing to get lost in. It's a redeeming factor in my life." It's been a six-year journey up until this point. Where do you hope to see yourself in another six years? "Somewhere peaceful, feeling happy. I feel like I'm on a good journey here with songwriting and I'm a bit clearer of what I want to write about. It's happening a bit more fluidly, so I imagine there's another album in me." 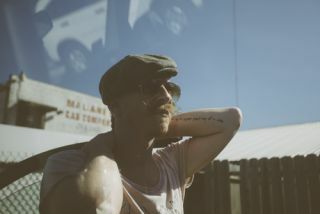 Foy Vance's new album, the Joy Of Nothing, is out now on Glassnote Records.